At MyGet support, we sometimes have to capture HTTP(S) traffic in order to be able to diagnose the issue at hand. If this is the case, we'll send you to the page you are currently viewing. Disable capturing traffic using the File | Capture Traffic menu. 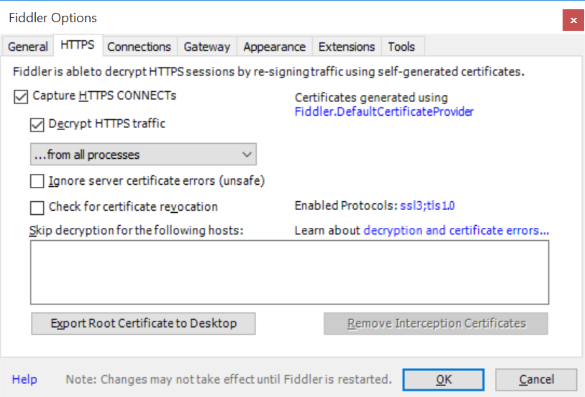 Make sure to verify Fiddler is set up correctly using the above steps. Next, make sure Fiddler is configured to capture traffic by using the File | Capture Traffic menu. Once the requested actions have been performed, use the File | Save | All Sessions menu and store the captured sessions. MyGet support will ask to send over the saved archive. Make sure to start Fiddler prior to NuGet or Visual Studio. After capturing traffic, the proxy settings can be removed.